Homebirth had a perfect record in 2013. Not a single scientific paper or set of state, national or international statistics showed homebirth to be safe! And, of course, the Midwives Alliance of North America (MANA), the organization that represents homebirth midwives, continued to hide its own death rates. 1. 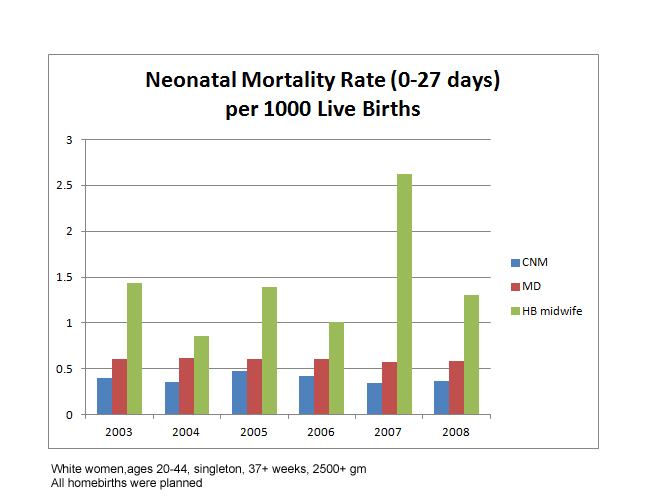 New CDC statistics, same old increased homebirth death rate. The dramatic increase in homebirth death rates has been remarkably consistent over the years. a. All homebirth transfers are included in the MD numbers. That means that any deaths that occurred after the mother was transferred to the hospital are in the MD group and not in the homebirth group where they belong. This is important because we know that many homebirth deaths occur because even being “10 minutes from the hospital” is not close enough to save a baby in a life threatening emergency. b. Intrapartum deaths are not included in these statistics at all, because those babies don’t get birth certificates. All those homebirths where dead babies drop into the hands of unsuspecting homebirth midwives (“the heart rate was just fine a minute ago”) are not noted here. 2. 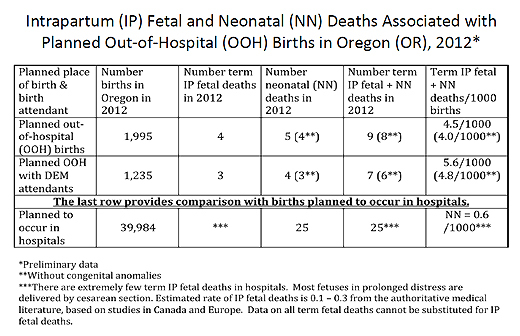 Oregon releases official homebirth death rates, and they are hideous. You may recall that back in August 2010, Melissa Cheyney, the Director of Research for the Midwives Alliance of North America (MANA) and also the head of the Board of Direct Entry Midwifery, rejected a call by the State of Oregon for access to the MANA homebirth death rates for Oregon. 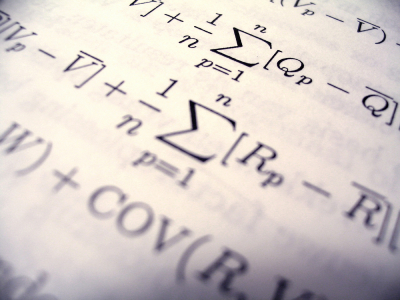 As a result, the State decided to collect the statistics themselves. They turned to Judith Rooks, a certified nurse midwife and midwifery researcher who is known to be a supporter of direct entry midwifery, to analyze the Oregon homebirth statistics for 2012. The death rate is horrific, even AFTER Rooks inappropriately eliminated the death of a baby at homebirth who had congenital anomalies. Since the hospital group contains congenital anomalies, it is not appropriate to remove them the homebirth group. 4. New analysis from Arizona shows — yet again — that homebirth triples the neonatal death rate. Homebirth increases the risk of neonatal death by a factor of 3 or more. 5. On the international front, the results are much the same. Dutch midwives struggle to avoid accountability for high perinatal death rate. Ank de Jonge, the leading apologist for Dutch midwifery, attempts to avoid responsibility for the high perinatal mortality rate, but actually finds the opposite. After restricting the analysis to term births, de Jonge found that the Netherlands has one of the worst perinatal mortality rates in Western Europe, although now they have the sixth worst rate, instead of the third worst rate. In other words, de Jonge confirmed that there is a serious problem with perinatal mortality in the Netherlands including the perinatal mortality rate at term. She confirmed that there is significant evidence that Dutch midwives bear responsibility for the Netherlands poor perinatal mortality rate. De Jonge tried again in another paper that utterly misrepresents her own findings. 6. De Jonge is at it again, slicing and dicing data in yet another unsuccessful attempt to show that homebirth is safe. De Jonge compared the number of women who SURVIVED severe complications at homebirth to the number of women who SURVIVED severe complications at hospital birth. She didn’t compare the number of women who EXPERIENCED severe complications in each place. And she didn’t compare how many women DIED at each place. Without that information, de Jonge is not entitled to conclude anything. Severe maternal morbidity is an appropriate measure of safely ONLY when death rate is zero or nearly zero. If the death rate is not zero, that MUST be taken into account in assessing safety. My Letter to the Editor of the BMJ regarding this inexplicable oversight was published the same day. de Jonge and colleagues have responded, and what do you know, the maternal mortality was NOT zero. Fewer women in the homebirth group experienced severe acute maternal morbidity, but that’s nothing to crow about if one of them died and might have been saved in the hospital. 7. Elsewhere, Australian midwives boast about terrible homebirth death rate. Setting a new standard for cluelessness, Australian midwives are proudly presented the results of a publicly funded homebirth program, a program that has a homebirth death rate 5X higher that of term hospital birth. And that probably undercounts the deaths and complications because reporting was voluntary and only 9 of 13 program directors responded. 8. Ironically, Save the Children illustrated US neonatal death by using a CPM attended homebirth. 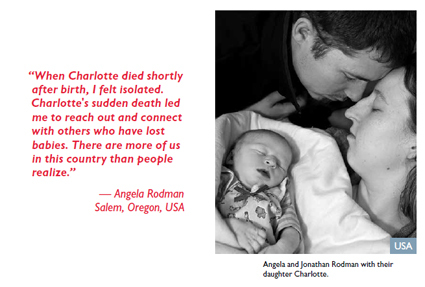 The organization (?unwittingly) used a photo that I recognized as a CPM attended homebirth death that was almost certainly preventable. 9. The most important paper on homebirth published in 2013 showed that homebirth increases the risk of a 5 minute Apgar score of zero by nearly 1000%! Most professional homebirth advocates have ignored it, but not MANA. They’ve published a “critique” that contains at least one bald face lie and many more untruths. 10. And how about the death rates of MANA’s own members? Melissa Cheyney continues to spews BS to justify hiding them. On October 24, ahead of the MANA13 national conference, Cheyney claimed that the MANA statistics cannot be released without the approval of an IRB (institutional review board). First, MANA itself has published almost all the data from the database EXCEPT the death rates. Second, while IRB approval could be required for publications based on the data, IRB approval is not required to read and review the data. As recently as September 29, Wendy Gordon claimed that there were no articles in press, but on October 24, Cheyney suddently announced there are two papers on the MANA statistics that will be published in the Jan/Feb 2014 issue of the Journal of Midwifery and Women’s Health. Be sure to read the companion piece 2013: The year in homebirth deaths and disasters. medicine. In your defense, home-birth advocates do the same thing. score better here but by how much? More importantly, what are the long term effects of home v. hospital births? disease. Medical staff are constantly cross-contaminating. Finally, what are the environmental effects on the child & mother? So you offer up 2 completely unsubstantiated anecdotes to claim that hospital birth is dangerous while Dr. Tuteur analyzes multiple large scale studies to which she always links, and SHE is the one doing “bad science”? Dr Amy is constantly summarizing the latest research on “these issues,” which you would know if you read around the site a bit more. And lol at your introduction of yourself juxtaposed with your wild assumptions and opinions. When you present your intelligence analysis/ animal behavior report (what wildly disparate fields! ), do you always end it with “I bet no one has addressed these issues”? For someone with your research skills implied by your profession, you sure did a poor job looking around this site. So go do that, see your questions get answered (don’t forget the comments where many actual medical professionals comment) and you’ll have your answer. I owe you a coke! This person is a freelance intelligence analyst now. Is that more or less frightening? It’s less frightening. In this case Freelance=Unemployed. Newborns who die of hospital acquired infections? Other than seriously premature babies who need machines to live, that’s incredibly rare. Check the CDC’s numbers yourself. I think you should look deep in your soul and ask yourself if you could still get your message out without exploiting families’ stories of trauma and grief, possibly compounding them. I think you could. I think homebirth “midwives” should look deep into their own souls and ask themselves if they have any right to practice when so many babies die at their hands. As an added benefit, I wouldn’t have dead babies to write about. When the families recognize that their trauma and grief is solely the blame of incompetent care providers and they want to warn other women from the same fate, Amy features them kindly and lovingly. Google the blog “Hurt by Homebirth” for many such examples. When they nearly bleed out or their baby dies at their HBA2C attempt and STILL proclaim that homebirth is 100% safe and natural and they’re definitely going to do it again and NO WAY is their severe 100% preventable PPH or 100% preventable dead baby the fault of abysmal “medical” care…she calls them on it. If someone creamed a family of 4 while driving drunk and told the court they planned on drinking and driving again this Friday…would you be against calling that person’s idiocy out? Or should they be “supported” while they work through their “issues”? I was doing some research on home birth when I stumbled across this page. I had my son (16 months) at a free standing birth center because I sincerely thought I was doing the right thing for him. I wanted a gentle birth. I didn’t like how my OB brought up termination at every visit and spent a grand total of 20 minutes with me during my first 20 weeks. I didn’t want to be pressured into taking drugs. I didn’t even want the option of a c-section unless something was horrifically wrong. To my shame, I did not even check how much education my midwives had received. After reading several of your posts I realize a few things but the most important of them is that our next baby will be born with a CNM. I have a million questions now but it seems like a lot of the questions left here go unanswered. (I can’t imagine you have enough time to respond to the hundreds of comments left on every post!) Just wanted to let you know you made a convert today. Hi, Tori! You can try the search function here for any questions that may have been written about in a blog post, but I found many of our regular commenters will answer questions, too. Maybe not immediately, but check back! There are OBs, peds, RNs, CNMs and others who will help you understand. Note that the Disqus commenting system may make it tough to follow comments sometimes, just stick with it. I sort by Newest. Why not join the Fed up with natural childbirth FB page? I bet a lot of your questions would be answered quickly there. Dr Amy is the moderator. Wanted to let you know that because of the work of Sara Snyder of Safer Midwifery for Michigan the newly updated Michigan birth certificates will track intended place of birth and intended attendant. Beginning in 2014 all birth certificates will detail who provided prenatal care, who attended the labor and/or birth, where the mother began labor intending to give birth, and her actual place of birth. It will now be easier for hospitals, physicians, midwives, and epidemiologists to sort out the stats and outcomes by place of birth, intended, and actual. Sara Snyder has given her son a really meaningful legacy. I have so much respect for her. Thank you Dr. Amy for this wonderful blog. I’ve been enjoy reading all the articles. I could never forget how the lady (lost her baby due to HB) cried after seeing my baby in my arm at the hospital door. She was the reason that I looked into NCB. Woos have now infiltrated Taiwan too; with what I learned here, I could explain better to my friends back home why “not all believes from US are science based”. Thank you for another year of fighting the good fight. I may never be able to exercise what I’ve learned here personally. But as I move into public health and social services, I can assure you that you are informing my practice. And the information I have access to and share because of you has changed the choices of people I know, persuading them that there are safer options. I also want to say thanks to Dr. Amy and to this site. I am now at term with my first child. When I first got pregnant, I was by no means militantly pro-natural, but I did believe that we do “too many” c-sections, that it’s better to avoid interventions if possible, and that laboring without pain relief has inherent merit. I believe I found this site in my fourth month, and I understand a great many things I didn’t before, including the key reason the c-section rate has gotten so high. Within the next week (gotta wait until tomorrow to get my OR slot) I will have a c-section. My child is complete breech and mildly growth-restricted. With a c-section and possibly a few days in the special care nursery, he’s going to be totally fine. But I am so SO glad that I understood the risks of breech birth before I learned my own child was breech. All I care about is getting him out safely, with a minimum of damage to me. That’s all I’ve ever cared about, and I think that’s all most mothers care about when it comes down to it. Thanks for helping me understand the best way to do it! Can’t wait to hear about the happy delivery!! Best wishes for a complication free delivery! Thinking of you this week! Best wishes for a smooth surgery and recovery. I’m so happy you get to meet your baby soon. All the very best for your upcoming birth, transition to motherhood, new baby, and recovery!! Hope everything goes smoothly and that you’re holding a lovely, healthy baby in your arms soon. Best wishes for a happy birthing and healthy mother and baby! I have had all of my children unassisted, the first two were twins. I had no complications, short labors, and easy births. Babies delivered safely…minimal damage. All of them. But then again, I don’t fear birth and I’ve always thought my babies would be born easily…provided I birthed them by myself. I knew what I and my babies needed to come out of birth safely, and that’s being at home and by myself (with my husband by my side, since you never know what life will throw at you sometimes). I just had my fourth on Christmas eve. I’m two weeks postpartum today and I’m done bleeding. Not only that, but I felt great after birth (we attended our Christmas family gathering the very next day, I was cleaning my house 12 hours postpartum!). I didn’t tear or even get a skid mark…I required no special care while urinating (even on the first day postpartum) because it just didn’t burn to do so. My babies…always very healthy. Came out pink and screaming, all four of them! If any of my children were breech, I don’t think it would have been much different. Some women know they need a c-section to get their breech babe earthside safely. That’s great! And I know exactly what -I- need to get -my- babies earthside safely. Clearly I (and a lot of other women) didn’t need a hospital or even a birth attendant to give birth. Some women do. And that’s fine. I just don’t see the point in all of these “birth wars.” What works for one woman/baby might not work for another. I think if women were just free to make the birth choices that were right for them, we’d see lower mortality rates. Favoring one type of birth over the other obviously doesn’t cut it, though. Lucky you. You are genetically capable of unassisted birth. You and your progeny will continue to pass on your superior genes. There is nothing more special about you than that. You are also a risk taker, so perhaps your children might benefit from extra supervision as they mature. You are also prone to magical thinking. Just because you believed you knew exactly what to do to get your babies earthside doesn’t make that true. Happy New Year, Dr. Amy, and THANK YOU! There is another statistic I want to mention, this time a happier one. A couple of women did this already, and I am hoping more will do so—let’s share how this blog helped us! I am so thankful I found Dr. Amy’s blog when I was pregnant. I stopped being anxious over all the crazy lies NCB crowd was spewing. I threw out my birth plan and decided to trust my doctor. In the end I needed an emergency C-section because my son was in distress. Thanks to Dr. Amy I didn’t feel that I failed. I didn’t try to argue with my doctor because I knew he had our best interests at heart. I felt at peace because I knew I made the right and loving decision. My son is now a happy and active toddler, and I remain a faithful reader! Dr. Amy, thank you for all your hard work. You are saving lives. Lovely summary. Where are the idiots, it’s 2014, let the games begin. Thanks for compiling the list; very useful! Happy New Year to Amy and all my SOB friends! Happy New Year the babies are already arriving! strong enough to refuse a c-section to appreciating the medical care I received. credentials and she didn’t say a word as decisions were being made. wasn’t favorable at all) and had the c-section that day. have let the nurses handle it, but she made it her priority to comfort me. doesn’t get said enough. Also the nurses are pretty amazing too. stories, it’s hard to keep reading. but it just shows how ethically driven they are. I’ll second that, almostfearless. I live in Australia, where our maternity units are largely operated by midwives (with a bachelor of MW, or RNs with a master’s in MW). I attended the hospital antenatal education classes, which are a crash course in the midwifery agenda: analgesia is BAD, and you are a BAD mother doing BAD things to your baby if you have any (except nitrous oxide/O2, which is acceptable somehow – because it is not particularly effective, perhaps? ), and that midwives would actually attempt to talk a woman out of it/stall, epidurals increase the rate of C-section, which are also BAD, BF is naturally superior to feeding “artificial milk”. I believed it all – I work in a hospital, why would I question the integrity of my colleagues? – and worse yet, I judged other people I met after the birth of my daughter according to that information (via an evil C-section for breech presentation – the horror!). Cutting a long story somewhat shorter, although the trauma is no longer fresh, it has left me struggling to understand the motivation of midwives in pushing the NCB agenda, but also wondering if my future in medicine could lie in obs&gynae, because I think women deserve honest and excellent care in a pivotal yet vulnerable time and maybe I could be part of that. There’s nothing like real-life experience for the insight that makes you a better doc! Best wishes for your ongoing career – AND family. Excellent summary of real numbers. Thank you! I really like the pairing of today’s post with yesterday’s post. What a devastating indictment against homebirth and CPMs. You cover the big picture of statistics and numbers while providing stories that illustrate so well what these numbers mean in terms of human suffering and I have learned so much from reading your blog. I hope 2014 brings further proof of the danger of homebirth in the form of academic papers and not tiny bodies (the tide has to turn at some point and I hope this is the year it happens). May we all have productive discussions on how to best convince homebirthers that hospital birth can fulfill their wish for a birth experience while providing safety in the event of complications. Yes, may there be far less disasters, far more moms happy and supported in their safe choices in birth and feeding and parenting, may the trolls stay under their bridges, and let the unicorns spread their glitter only for our laughs.